At Advanced Animal Care, we understand that your canine companion is not just a pet, but that he or she is a beloved, cherished family member. The mutual bond of love and loyalty between you can make a diagnosis of any form of dog cancer very difficult to hear. Our veterinarians and support staff are empathetic, compassionate and trained to focus on both the emotional and medical aspects of dog cancer. We are here to guide you both through the diagnosis and treatment process. This includes choosing the best options for effectively, humanely and successfully dealing with canine cancer. Unlike many other species of animals, dogs are susceptible to the same types of cancer as humans. Cancer is caused by the uncontrolled growth of cells in the body. These cells can originate in any of the body's tissues. If not found and arrested in time, cancer can expand and connect with the circulatory or lymph systems, and also can spread and infect other tissues in the body. Canine cancer is the leading cause of death for dogs 10 years of age and older. However, half of all cancer in dogs is treatable if it is arrested in its early stages. Hemangiosarcoma: This form of dog cancer is an incurable tumor of cells that line blood vessels, called endothelial cells. Although dogs of any age and breed are susceptible to Hemangiosarcoma, it occurs more commonly in middle aged or elderly dogs. Also certain breeds have a much higher incidence including Golden Retrievers and German Shepherds. For this reason, we may recommend additional screening these breeds after age 5. This form of dog cancer develops slowly and is essentially painless, so clinical signs are usually not evident until the advanced stages when the tumors are resistant to most treatments. Less than 50% of treated dogs survive more than six months, and many die from severe internal bleeding before there is an opportunity to institute treatment. Mast Cell Tumors: These are immune cells that are responsible for allergies. Mast cells can be found in all tissues of the body but typically form tumors on the skin in close to 20 percent in the canine population. They range from relatively benign to extremely aggressive. Certain breeds of dog are at an increased risk for the development of this tumor, indicating that genetics might be a cause. Boxers are especially prone to this type of cancer. Lymphoma: This form of dog cancer can affect any dog of any breed at any age. Most of the time, it appears as swollen glands (lymph nodes) that can be seen or felt under the neck, in front of the shoulders, or behind the knee. Occasionally, lymphoma can affect lymph nodes that are not visible from outside the body, such as those inside the chest or in the abdomen. This can cause trouble breathing and digestive trouble. Generally this form of dog cancer is considered treatable if arrested in its early stages. Standard Poodles, Golden Retrievers and Australian Shepherds are a few of the breeds with higher incidence of lymphoma. Osteosarcoma: This form of dog cancer is the most common type of primary bone cancer in dogs, accounting for up to 85% of tumors that originate in the skeletal system. Although it mostly affects older large or giant breed dogs, it can affect dogs of any size or age. Osteosarcoma occurs in many areas, but it most commonly affects the bones bordering the shoulder, wrist and knee. A major symptom is lameness in the affected leg, or a swelling over the area that seems painful at the site. Brain Tumors: Epileptic-like seizures or other extreme behavioral changes are usually the only clinical signs. CAT scanning and MRI is used to determine location, size and severity. Although some oral chemotherapy and radiation therapy can control some inoperable tumors, surgical intervention may be recommended if the tumor is operable. Bladder Cancer: Some breeds are more at risk for this form of dog cancer than others. This is a slow developing dog cancer, and symptoms may not show for 3 to 6 months. Urinary obstruction and bleeding are common symptoms. Mammary Carcinoma: Non-spayed female dogs are at high risk for developing malignant mammary tumors, but all female dogs regardless of reproductive state remain at risk. Approximately 50% of these tumors are malignant, and complete surgical removal is recommended if the cancer has not metastasized. Malignant Histiocytosis: This dog cancer affects larger sport breeds most often. It occurs as localized lesions in the spleen, lymph nodes, lung, bone marrow, skin and subcutis, brain, and periarticular tissue of large appendicular (limb) joints. Histiocytic sarcomas can also occur as multiple lesions in single organs (especially spleen), and rapidly disseminate to involve multiple organs. Unfortunately there is no reported effective therapy for this form of dog cancer. Squamous Cell Carcinomas: It is most often found in the mouth and the nail beds of the toes. Early detection and complete surgical removal is the most common treatment. Fewer than 20% of dogs develop metastatic disease. SCC of the tonsil and tongue are quite aggressive and fewer than 10% of dogs survive 1 year or longer despite treatment measures. Mouth and Nose Cancer: This is a very common form of dog cancer, more so in the mouth than the nose. Symptoms include a mass on the gums, bleeding, odor, or difficulty eating. Since many swellings are malignant, early, aggressive treatment is essential. Cancer may also develop inside the nose of dogs. Bleeding from the nose, breathing difficulty, or facial swelling are symptoms that may indicate nose cancer. Melanoma: This form of dog cancer most commonly occurs in canines with dark skin. Melanomas arise from pigment producing cells called melanocytes, which are responsible for coloring the skin. Melanomas can occur in areas of haired skin, where they usually form small, dark (brown to black) lumps, but can also appear as large, flat, wrinkled masses. Malignant melanoma, which develops in the mouth or in the distal limbs (usually the toenail beds), is an incurable disease. These tumors have very often spread to distant parts of the body by the time they are first noticed, making complete surgical removal impossible. 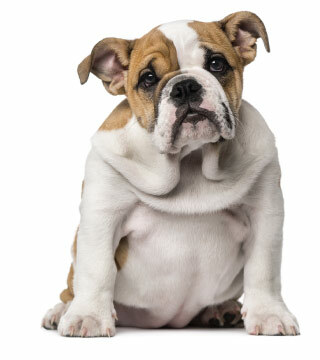 Testicular: This form of dog cancer is common in unneutered dogs with retained testes. This form of dog cancer is largely preventable with neutering, and curable with surgery if arrested early in the disease process. Should you witness any signs of cancer in your dog, we strongly recommend making a veterinary appointment immediately. Tumors in dogs usually appear as fleshy but solid lumps of tissue underneath a dog's skin and fur. Not all tumors will be outwardly evident. Sometimes you can see evidence of tumors and sometimes they are deep within the body of the dog. However, early detection and treatment are key to preserving your dog's health and quality of life. Therefore, it is important to periodically inspect your canine companion for any abnormal lumps and keep a semi-annual veterinary appointment schedule. Owners most commonly find a tumor on their dog while petting or bathing. If you are running your hand over any part of your dog's body and feel a lump, call to make an appointment with your veterinarian. Most likely, the veterinarian will want to do a needle aspirate to get cells from the tumor to get a diagnosis on the type of tumor. The diagnosis is helpful in determining what if any type of surgery and or follow up cancer care may be necessary. Some tumors in dogs cannot be visualized but can be palpated (felt with touch) by your veterinarian during the exam. For instance, an enlarged spleen may be palpable to your veterinarian but not visible to the owner. You can reference the list of canine cancer symptoms above to get a better understanding of what symptoms to be on the lookout for. Only a veterinarian can accurately diagnose canine cancer. This is why it is extremely important to schedule periodic wellness exams for your canine companion. During these preventive exams, your veterinarian can check your dog for signs of canine cancer. Treating canine cancer before it advances is key to successful recovery. The patient's overall health status plays a major role in therapy choices for dogs with cancer. This includes evaluating the patient for his or her ability to tolerate cancer treatment. Life expectancy should be taken into consideration as well; for a slow-growing tumor in an older dog, for example, treatment drawbacks may outweigh potential benefits. There is a lack of consensus as to whether you must choose only one course of treatment, or if multiple treatment options can be combined effectively. Sometimes combining methods works well for dogs with cancer, but that may not always be the case as some treatments may interfere with each other and potentially cause unintended harm. These are important issues to address with the veterinarian at your next appointment. If you suspect dog cancer, whether finding a bump or witnessing behavioral symptoms, please contact us immediately to schedule an appointment. Our veterinarians and support staff will provide you and your canine companion with compassionate, comprehensive dog cancer care and support services. Although dog cancer can be overwhelming, you don't have to go through it alone. We are here to help ease your dog's pain and suffering and eliminate the cancer through the best dog veterinary care available.